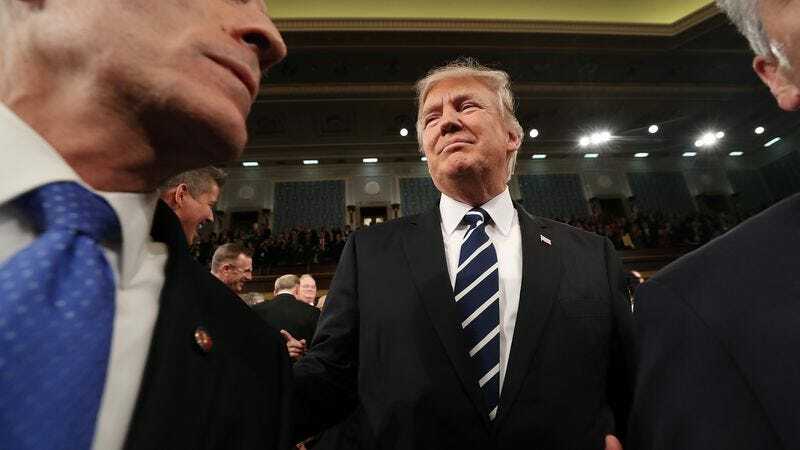 President Donald Trump is addressing his first joint session of Congress right now, laying out his arguments against immigration, his easy softballs to the middle class and soldiers, and his lame jokes about riding motorcycles, a set of expected schtick that’s being met with rapturous applause from one half of the room, and stony, white-suited contempt from the other. But while Trump is staying pretty firmly on message—even when that message is “repeal Obamacare” or “reactivate the plan to rebuild the Dakota Pipeline”—he still couldn’t keep his urge for competitive hyperbole under control when it came to his beloved wall. Talking about the nation-long barricade he still intends to build on the Mexican border, Trump was unwilling to simply refer to it as a “good” wall, or even a “strong” wall in his speech. No, the president had to do the ancient Chinese people one superlative better, declaring his upcoming efforts at Duplo diplomacy “a great, great wall.” Unsurprisingly, Twitter quickly caught onto this turn of phrase, noting that that extra, China-trumping “great” wasn’t in the original text of Trump’s speech. Matt Damon—whose own recent wall was forced to suffer with only a single Great to its name—couldn’t be reached for comment on Trump’s challenge to his brick-and-mortar dominance.